The pumpkin keeps the gingersnaps extra soft and moist, which is a must. I only like soft gingersnaps. 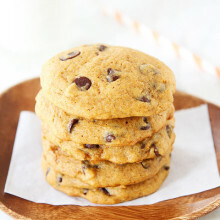 The texture of these cookies is perfect-slightly crisp on the edges with a soft and chewy center that is full of flavor. The molasses, cinnamon, ginger, cloves, and pumpkin all come together to create the perfect Fall cookie. I rolled the cookies in sugar before baking, which adds a hint of sweetness and a pretty cookie top. I know I will be making these Pumpkin Gingersnap Cookies every Fall. They are a new favorite! I hope you like them too! In the bowl of a stand mixer, beat the butter and sugar together until creamy and smooth. Add the pumpkin, molasses, egg, and vanilla extract, mix until well combined. In a medium bowl, whisk together flour, baking soda, spices, and salt. Add dry ingredients to wet ingredients and mix until combined. Refrigerate the cookie dough for at least 1 hour. The dough can be chilled for 2-3 days. When you are ready to bake, preheat oven to 350° F. Line a baking sheet with a Silpat or parchment paper. Place sugar in a small bowl. Roll tablespoon-sized balls of dough in sugar until well coated and place on prepared baking sheet, about 2 inches apart. Bake for 10–12 minutes, or until cookies look cracked and set at the edges. The cookies will still be soft. Let the cookies cool on the baking sheet for a 2-3 minutes after removing them from the oven, then transfer to a wire rack to cool completely. Love the idea of pumpkin gingersnap cookies! what a perfect combination. They look amazingly delish…and your pics are so beautiful too! (as always). These ingredients are right out of the pantry too which I love. These look delicious and perfect for this time of year! I’m also going to check out your other gingersnap recipes for the holidays, yum! These look amazing. I love gingersnap cookies. And that they’re pumpkin infused…nice! I am Pinning these to my pumpkin board! your soft gingersnaps are staples in my holiday baking list! i seriously tell everyone about them. i can’t wait to try these! Oh these sound and look perfect! Gotta make these! These remind me of packaged chewy gingersnap cookies that I used to love. These cookies look fantastic with the pumpkin in them! oh maria…these sound so good. they remind me of the ones my mimi used to make! i would eat them on road trips and down an entire bag before i even knew what had happened! Yum! We make the big soft ginger cookies from AllRecipes every year, and I’m obsessed with the idea of making fall ice creams for ginger cookie ice cream sandwiches. I’m going to try your recipe too, because it might be perfect. Those look scrumptious Maria, one of my very favorite cookies to much on this time of year! Hope you have a great day!! I haven’t had gingersnaps in a long time. I love ginger too! Oh maria what a great combo! 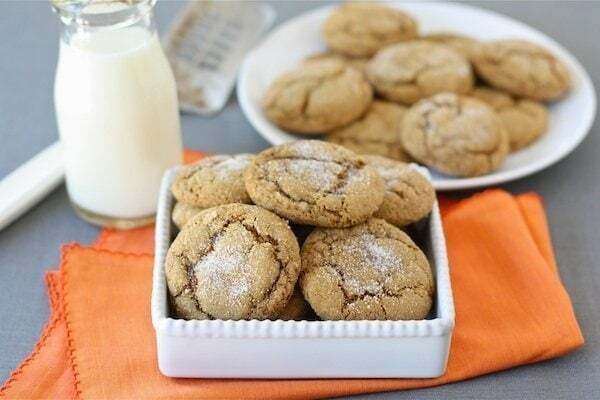 Gingersnaps are a favorite cookie of mine and I love pumpkin. Putting them together in one cookie is a home run! I too like a chewy cookie better. Can’t wait to make these. Congratulations on the little one, he’s a cutie! 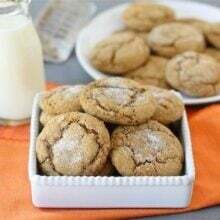 I love soft and chewy gingersnaps, I’ll be adding these to my holiday baking list! Im home sick today and these cookies might just be the thing to make me well again! I’ve been contemplating what to do with the little bit of leftover pumpkin puree in my fridge. Now I know–pumpkin gingersnap cookies it is. Am loving that Fall flavor combination. Just gorgeous and perfect for fall! they look beautiful! i love the sugar crust on gingersnaps, and soft ones are my favorite. I love all your pumpkin recipes for Fall! These cookies look delicious and I can not wait to make them. Thank you for sharing all your wonderful recipes 🙂 My husband can not get enough of your cilantro lime rice! Cookies look great guys! But I think I want a picture of the little one too! Great combination of flavors Maria – these sound like the perfect fall cookie to me!! Will definitely be adding pumpkin to my ginger cookies – and did you know if you dip the cookie dough in water and then in sugar it creates a great sugar crust topping? Great tip Lucy! Thanks for sharing! I love pumpkin and I love gingersnaps, I bet together they are amazing! I know two little boys who will be enjoying this for after school snack today – hoping these will brighten up our rainy/drizzly day!!! Adding this to the never-ending list of pumpkin recipes I NEED TO MAKE that have been accruing! Bookmarked! These look too good not to make. Hope all is well with you and your little one. Awesome idea! I love soft gingersnap cookies too! And I’m always looking for new pumpkin recipes to try. I’m baking these this weekend! Oh my goodness. I am LOVING all of your pumpkin posts. Bring ’em on! These look so so good! Thank goodness my canned pumpkin seems to be never-ending; I could make (and eat) so many of these pumpkin treats! oh you are SOOOO right. This is the PERFECT match for my pumpkin gingersnap ice cream! OMG, I just bought the stuff to make pumpkin spice cookies, we’re thinking alike, LOL. Oh and these look AMAZING! I just pinned them and cannot wait to try them out!! Gingersnaps are my favorite cookie! Love this fall twist on a classic. Going to bake these up over the weekend. Thanks! Mm, these remind me of the holidays! Oh my goodness… These are just genius. I love gingersnaps, and the addition of pumpkin? YUM! Spur of the moment dinner guests meant I needed a quick dessert. I also had a partial can of pumpkin in the fridge. Cookies seemed the best bet, and of course, Two Peas and Their Pod, came to mind first. And what recipe appeared on the home page? This one! Whipped these up in no time. They were so tasty! I might dial back the cloves next time, so that the pumpkin can shine through more. But trust me, these were divine. Ooh these sound fantastic and what a perfect marriage between the gingersnaps and pumpkin. I wish I’d thought of that. I love this recipe and know others will as well. Would you consider adding this recipe on my “Virtual Cookie Swap & Giveaway” that I’m doing right now? This is one of those recipes I know everyone would love. I LOVE LOVE LOVE LOVE LOVE this recipe! PS…can you tell I am excited!? I’m not even the biggest gingersnap lover, but this is making me want some!! I made these last night and they are wonderful! So chewey and deliciously gingerbread-ish! I am a lover of gingersnaps, however, tend to use them as crusts for tarts and cakes because of how hard they are..yuck! I am glad to have this recipe now:). I do have a quick question though…how do you store yours? I placed mine on my cake stand and covered, but I think they need more air. Do you leave yours uncovered? I just didn’t want them to dry out:). Gingersnaps are Ryan’s favorite and I’m always looking for new variations to make–I can’t wait to try these soon! I can not believe how busy you are in the kitchen lately! Good for you! You got right back in the saddle! Hope you and the baby are doing great! Oh no! Now I have to make these! YUM! They look amazing Maria! I’m All-Pumpkin-All-The-Time right now. I can’t get enough. Delish!! Maria, you’re killing me with this stuff! I love gingersnaps in a crazy way. Especially the soft and chewy variety. If I weren’t out of pumpkin, I would be making these right now instead of just looking at the pictures and drooling! So far, my favorite ginger cookie is a chocolate gingersnap that I just discovered last year. It has mini chocolate chips and chunks of crystallized ginger in it. It’s also soft and chewy and absolutely divine! We’ll see if your pumpkin gingersnap knocks it out of first place. I only like soft ginger cookies too, and these look absolutely fabulous! Will definitely have to add these to my cookie trays this year! Delicious idea, Maria. If I were near, I would bake you some 🙂 Caleb, is adorable. I love gingersnaps, too. Never would have thought to add pumpkin to them. Thanks for the inspiration! Oh this is my kinda cookie!! 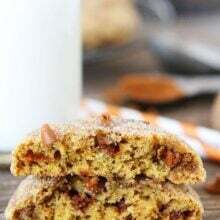 Wow, ginger snaps and pumpkin squished together to make perfect yumminess?! How great is that? Your cookies are honestly perfection. Love the photo as well and am new to your blog but always see the title just about everywhere. Now I know why. Congrats on your baby. You just combined my two favorite cookies! Thanks for the recipe…can’t wait to try! Whoa! Pumpkin and gingersnaps all in one cookie? These look so delicious, they are definitely going on the “to-try-soon” list for sure! So glad you liked the pumpkin cornbread! Isaac loves gingersnaps and I love pumpkin – these are perfect for us! The recipe looks delicious. I recently make some pumpkin snickerdoodles, but now you have me craving these! I’m loving the pumpkin recipes out there. Never get sick of them! Love how you’ve combined pumpkin with gingersnap spices to get a winning combination- crispy on the edges and soft and chewy in the center, full of gingersnap spices. 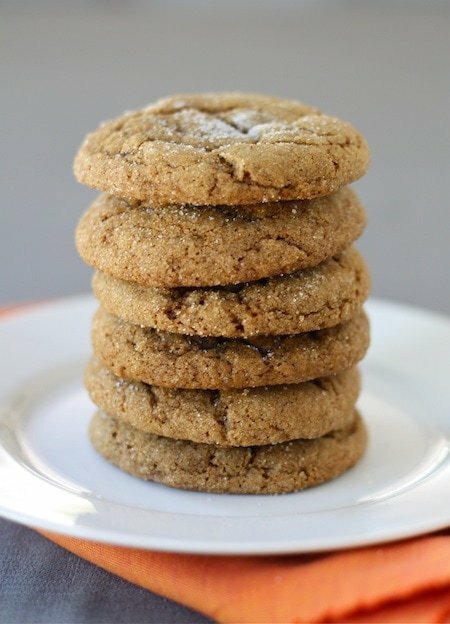 I LOVE Gingersnaps… and I am so excited to make these! I do have a question though… is the pumpkin called for in the recipe the canned pumpkin or fresh puree’d pumpkin? I am NOT a baker, so I have to be sure I know what to get! 🙂 THANKS! I used canned pumpkin fort this recipe! Enjoy the cookies! im guessing you mean ground cloves, right? thanks! You’ve just reminded me of my own recipe for pumpkin-molasses cookies. One of my hubby’s favorites, I’ll have to make them soon! Great idea! I love the taste of both pumpkin and gingersnaps :)! What a great idea to add pumpkin to gingersnaps. 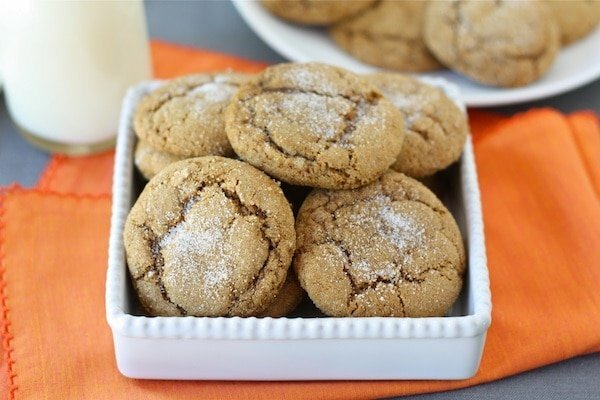 Gingersnaps are one of my favorite recipes and these sound even better!! These were so tasty and soft, everyone loved them, thanks! I am glad everyone enjoyed the cookies! hi! i found you from ‘our best bites’, when your nutella cookies were shared and linked. wow. so naturally next time i wanted to try out a new cookie, i came here! these cookies tasted perfect – the flavors and spices are right on! but my cookies were so flat and moist that they actually glued themselves together when i stacked them to store. any tips? like mixing times? i never know if i should beat cookie doughs 30 sec. or 5 minutes. especially during the butter/sugar stage. thanks for sharing your recipes – i have the pumpkin granola bars in the oven right now! Hi Jamie! Welcome! I am glad you found us:) Did you bake them long enough? Cream the butter and sugar together until smooth-this usually takes 3 minutes. Let me know if you have any other questions! wow, those sound great. I am going to try making these Gluten Free!! Thanks for the idea. Amazing! Made them, loved them! Love gingersnaps- soft and chewy ones- and love pumpkin cookies so I thought I would love these. Just liked them…they didn’t have a real pumpkin or ginger taste to them so I felt like something was missing. Still fun to try a new cookie! Pingback: 23 Ways to Use Up Leftover Pumpkin Purée | food. shoes. booze. This recipe looks tasty but surely the point of a pumpkin recipe at this time of year is to use fresh pumpkin! How should we prepare the fresh pumpkin so that we can use this for biscuits? Made these today with fresh pumpkin, substituting half the butter with oil, halving the cloves, and using 2/3 the sugar. They’re delicious, though they didn’t crackle on top like your batch. If I make these for company, I might use the full amount of butter. Are you sure you didn’t use brown sugar in this recipe? Mine turned out really cakey, not chewy, and I think it’s because of the lack of brown sugar. Yes, I am sure. I used granulated sugar. Sorry you didn’t like the cookies. 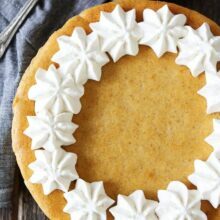 The pumpkin creates a cakey and soft cookie. I love these cookies. This is how I found your site last year when I was looking for what to do with some extra pumpkin. Will these freeze well? Or how long will they still stay nice and fresh in a container? Yes, they freeze well. Store in an air tight container. On the counter, they are good 3-4 days. I just made these today, after dreaming about them for the last week since I saw the pin. But I have to say am a little disappointed. All I can taste is the baking soda. Do you think the baking soda could be reduced without hurting the texture, because they were perfect otherwise. I followed your recipe to the “T” and was wondering if the batter is supposed to be liquidy/wet. After I put the molasses in, it was like liquid cookie dough. The flour firmed it up a bit and refrigerating the dough helped. I’m certain I put in the correct amount of molasses. Interesting though – even with such a liquidy dough, the cookie didn’t over-spread. Thanks for your help. It is a moist dough due to the pumpkin. Making these right now. My dough is really sticky. Any suggestions? I put it back in fridge hoping to use it later. However, mine do not look like yours. I realize that pumpkin creates a more cakey cookie, but mine rose high and are very fluffy. I love them, but I was really hoping for those chewy cracked edges like in your gorgeous photos. Any suggestions? 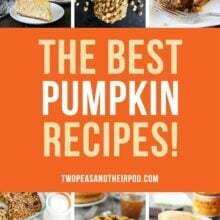 What a FABULOUS collection of pumpkin recipes! My house smelled like heaven last night, baking the Pumpkin Ginger Snap Cookies! They’re delicious too! These look so good, I have made so many of your recipes and they are all wonderful! I was so excited to make these, but when I finally did I was disappointed! I decided to double it because I was going to give some away. Well they have way too much baking soda in them. That is what I mostly taste and leaves an after taste. Too bad because it looked and sounded so delicious! I am throwing these away. Sorry you didn’t like the cookies. I’ve never noticed a strong baking soda flavor. What would be a good substitute for molasses in this recipe? Brown sugar any good? I haven’t made the cookies without the molasses. That is what gives them the gingersnap flavor. I just baked these, and they are very tasty, thank you for the recipe. I used cookie cutters, so they are slightly flatter and they didn’t crack like yours, maybe from over beating the dough. But the outside was crunchy and the inside cakey. I also left the dough in the fridge overnight. These cookies are delicious! I made them exactly and wouldn’t change a thing about the recipe! Crispy on the outside soft on the inside and they taste like autumn :). Glad you liked the cookies!! Loved the cookies! Though I realized that because I used fresh pumpkin puree, the dough was more moist than it should have been–which also meant softer cookies. So I baked them for a bit longer. But just a heads up for those who aren’t using canned pumpkin, maybe drain the liquid off a bit. I need a recipe for using some leftover pumpkin. This was perfect! So easy and I had everything I needed in my pantry. They taste so good! I will be making these again. I read most of the comments, but nobody said they made these cookies. However, this morning, I made the dough. I am very impress with the consistency texture of the dough. I had sample the dough before refrigeration. AMAZING flavors! In addition, I included 1 tsp of nutmeg in the recipe. I strongly suggest you try this wonderful cookie recipe. I will inform you about the final product. Thank you for sharing the recipe. I have finished baking the first batch of cookies…..These are HEAVENLY! Oh my…thank you for the recipe. I will bake them for the Thanksgiving holiday. I just made these and they are the best cookies I’ve made yet this season. Absolutely perfect! I’m thrilled. I made these over the weekend and they were fabulous! When I started I didn’t realize that I was pretty much out of white sugar (I had just enough to roll the cookies in) so I subbed in brown sugar and cut back a tiny bit on molasses and they were still great. So light and fluffy! Thanks for sharing! Was very excited to make these and so wanted to love them but they were terribly disappointing. I don’t even think you can call these “cookies.” They baked up like little clouds and never fell. I knew they were supposed to be of the softer variety but these weren’t that. Loved the dough, though. Outstanding flavors. Just whipped this recipe up and it’s pretty wet-looking dough .. accurate or should I add a pinch more flour? Oh my goodness, I am going to make these when I get home Sunday! I love the combination of pumpkin and gingerbread (and I love them separately too! LOL!) and cannot wait to add these to my favorites!!!! Thank you so much for posting! These cookies are wonderful! Crunchy on the outside, soft on the inside without being cakey, and bursting with flavor. Can’t wait to make them again at Christmas. I used whole wheat white flour instead of all purpose, upped the spices a bit, and used an unrefined sugar, they turned out great. A hit with everyone in our household, which is not easy. I blogged them here. I made these, and they were good, but the dough was a little gooey for rolling with the added moisture from the pumpkin. Also I really couldn’t taste the pumpkin at all, they just tasted like the chewy ginger snaps I’ve been making for years*shrug*. Good cookies, but nothing special in the pumpkin department. These look amazing! Do you think blackstrap molasses will work in these? Thanks! Wow these cookies are awesome!! They are such a big hit here I just mixed up my 3rd double batch this week!!! Maybe I will get some of this batch. done a amazing job with this. Additionally, the blog loads very fast for me on Chrome. I made these last year and just re-came across the pin so decided to make them (totally forgetting that I had ever made them before). YUP – as amazing this year as they were last year!! I happened upon these on Pinterest. I am dairy free so I used my favorite vegan spread (Earth Balance) and it worked really well. The cookies were cake-like and delicious! Thanks for sharing the recipe! Made these today — they look gorgeous, smell heavenly and taste like Christmas! A winner and my kids loved. Mine were puffer than the photo, but that’s not a bad thing! What type of molasses do you recommend? I usually don’t keep molasses in the pantry…it’s usually King Syrup we keep. I’ve made these twice already and they are a hit and get devoured! My question is do they freeze well? Do you freeze individually or is in a container okay? Lovely recipe!! Quiet glad i found this!!! Would not change a thing and they worked out perfect!! Thank you!! Just wanted to say that these are great! They’re really soft and they have the perfect combination of flavors. I will definitely be making these again. Thanks!! Whoa! I can taste this ginger snapping in my mouth. Pingback: Pumpkin Spice Cookie Recipe & more Cookie Recipes! Just made these, adding some Ghirardelli 70% chocolate chips. Fabulous!! Will be in my regular cookie rotation! Next time I’m planning to double the recipe, form the cookies and freeze before baking. Then just take out as many as needed and bake adding just a minute or two to the time. These cookies are AMAZING! Soft, soft, soft, and oh so delicious. I have made two batches in the past week, and upon tasting some from my first batch, a friend declared, “You should go into business!” My entire family loves these, which is a huge bonus. Thanks for the awesome recipe! Made these this weekend – fantastic! Took most of them to my office this morning and they were gone in record time. I think one person ate at least 6. These will be made over and over again. Thanks Maria! These were tasty but they did not have the superb texture of my usual molasses cookies and they did not fall and crack. I’m sure that is due to the extra moisture of the pumpkin. The slight (almost indiscernible pumpkin flavor isn’t enough to make these regulars at my house. Ginger and pumpkin- two absolute perfect flavors together. Forget chocolate and peanut butter! I just made these and they are absolutely delicious!! Just found this recipe and want to make them for Christmas. Do they freeze well? Thank you for sharing. Found this on Pinterest. These were a huge hit at our Christmas gathering on Sunday. Very tasty. Not overly sweet like so many cookies. Just the right balance of flavors. Thanks again for sharing. These are incredible. Perfect blend of crispy outside and soft in the middle. I can see I’m going to have to make another batch because these will last about 10 minutes. Ha! They don’t last long here either! I made a double batch. Delicious. Perfect balance of spices. I sifted the dry ingredients together instead of mixing in a bowl with a whisk. After cooling for a few minutes, I loosened, but left them on the parhment paper to cool on the cooling rack. Very simple recipe, although they are very sticky before you roll them in the sugar. This will become an autumn staple for our house. I’ve made these twice now and they keep coming out puffy and cake like- not flat and chewy!! Is this happening for anyone else?! Should I lessen the baking soda? These are a go-to pumpkin cookie recipe in my house – made them for my book club Monday night and took the leftovers to work on Tuesday. Everyone raved about what good cookies they are! Thanks for such a great recipe! The recipe sounds delicious but is , I”m sad to say, terribly misnamed. A ginger snap requires a “SNAP” to it, which you don’t get in a soft cookie. You might consider renaming the cookie to Chewy Pumpkin Ginger cookies or something like that. OR…and I just thought of this and may try it…I’d make (or purchase) dried pumpkin strips and pulverize them in my blender and use the powder for flavoring and substitute some of the pumpkin powder for some of the flour…. One 15 oz. can will do it. Enjoy! They turned out amazing! Nice and chewy and soft and you can’t tell they are gluten-free. Thanks for posting this recipe! Made these today and they are wonderful. Only problem I had was when I rolled them into balls the dough stuck to my hands, what can I do to prevent this next time? These cookies have great flavor but turned out like a boxed cake mix cookie. They look like they shld be set around the edges with soft centers. Not so. Just puffy and soft all over. Hi Maria, I have made your pumpkin gingerbread cookies many times. My love and I love them very much. My question is, can the dough be frozen as I always make a double batch? Do I store the cookies at room temperature? How long will they keep? Yes, I keep them in an airtight container on the counter. They will be good fro 2-3 days. You can also freeze them. They did not flatten or have a cracked top and edges at all. I will not make these again. They are more cake like than cookie. I will stick to my “tried, tested and true” recipe in the future. The addition of the pumpkin doesn’t add any flavour. I love this recipe! I like to add a little more molasses and a little less pumpkin plus dip the bottoms in chocolate. It’s my go-to cookie recipe now! I tried the recipe. They came out fluffy and cake like. Would you increase the butter to give it the chewy crackled look? Would you keep it the same and melt some of the butter? They look amazingly and your pics are so beautiful too! I probably did something wrong in the mixing process. Mine came out more like little cakes than cookies, and not spicy enough. I was hoping for flat discs, but these rose a lot and were too cake like for my tastes, especially since I was hoping for a cookie. ABSOLUTELY FANTASTIC!!! Twp thumbs up from grownups and children alike. What a wonderful addition to my holiday cookie trays, thank you. They came out perfectly the first time, even at high altitude, but I would tell high altitude bakers to watch them at about 8 min as mine were almost too done at 9 minutes. Any help you could provide would be greatly appreciated as these used to be my FAVORITE fall cookie recipe! I’ve made these many times and they are my favorite cookie. I’ve always used fresh ginger but am wondering if ground ginger would work? I just made these yesterday. They were great and will probably go on my Christmas cookie rotation. I did make a few changes. I sub’ed 1 cup whole wheat pastry flour for 1 cup of AP flour, and instead of 1 cup granulated sugar I used 1/3 cup brown sugar, 1/3 granulated and 1/3 splenda. And I added about 1/4 cup small diced crystallized ginger to really amp up that ginger flavor. I loved them. These cookies were a HIT! Soft inside and lovely chewy edges with a beautiful mix of ginger and pumpkin flavours. A new Fall favourite for me! Very good I really I the receipe of pumpin gingersnap thank you for this reciepe. Can the dough be frozen? I would like to give them as part of a cookie tray but don’t want to use a lot of storage space prior. Amazing show-stopper cookies. They’re the softest and everyone at work will love me forever for bringing them in. This recipe I’ve made twice now and it will become a tradition for me. The subtle sugar coating makes the texture of the cookies even better.